Kevin Love is already known as the Best Rebounder on the Planet. On Saturday, he was also the Best Three-Point Shooter on the Planet. Love beat Kevin Durant and 5 other shooting stars, needing a tie-breaker to advance out of the first round, and another one to knock out Durant in the head-to-head Finals. Love is the second Bruin to win the annual competition, and he’ll have to win again next year to equal the back-to-back Championships garnered by Bruin (and now Laker) Jason Kapono in 2007 and 2008. But don’t put it past him — In terms of individual goals, when Love sets his mind to something, he never fails to accomplish it. After setting records for Double-Doubles last season, he decided to expand his Offensive role for the Timberwolves, and he succeeded, raising his average to 25 Points a game. And he isn’t doing it at the EXPENSE of the team. Perennial doormat Minnesota is actaully at .500 this season, making them the League’s 2nd most-improved team, and putting them only 1 game out of a Playoff spot at the All-Star break. "LOVE FROM AFAR" was published on February 26th, 2012 and is listed in Blue & Gold News, Non-Rivalry News, UCLA/usc/Sports Photos. I LOVE Kevin Love. 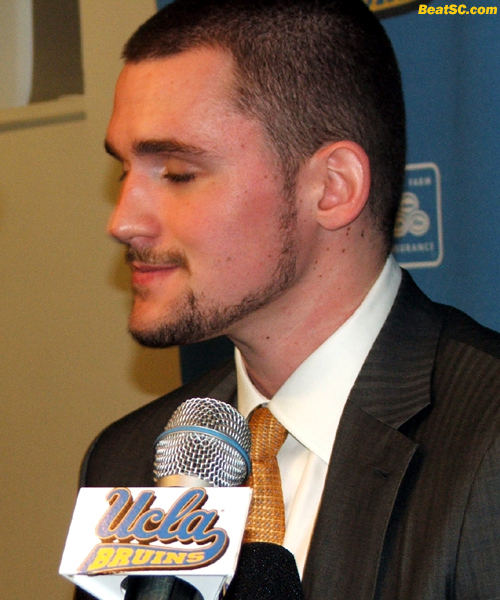 I wish he had stayed at UCLA for 4 years. He always represents our school in a positive way on and off the court. I wish he were a Clipper or a Laker. GO BRUINS!